Surround yourself with potpourri sachets made with your own dried flowers. You can make them any size you want and in any design. They also make wonderful little gifts for any occasion. The basic concept it to crush or grind potpourri and contain it in fabric. You can place them among sheets, nightgowns, in cupboards, on hangers and even over the vents in your car. I have found the simplest way to crush the dried flowers is to put it in a plastic bag and go over it several times with a rolling pin. I have also heard people say they use a quart jar or even a can of vegetables. Anything will work that is heavy enough to crush the flowers. The easiest way to make sachets is to cut two pieces of fabric (3 by 6 inches is an average size). Sew up three sides, leaving an open end, turn right side out and fill halfway with potpourri. You can then sew the open end up or tie with a ribbon. If you want to make a car freshener just sew the two long sides and fill with potpourri and then tie each end tightly with ribbon. Place over a vent in your car and you will have a very nice fragrant smelling car. There are endless possibilities for potpourri sachets. They make beautiful little Christmas tree decorations. Just cut out the shape of a Christmas tree, angel, doves, or even gingerbread people. Sew them part way, fill them with your favorite potpourri scent and finish sewing them up. Hang them on the tree, fireplace mantel, door knobs or even from your lamp shades. They add a very homey effect to your home. Try using different fabrics such as lace, silk satin, gingham, calico or silk. 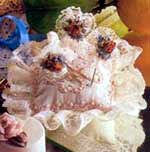 Crocheted doilies or pretty handkerchiefs make beautiful potpourri sachets. You can make the doilies or you can often find them at estate sales or thrift shops. I have found some really nice old handkerchiefs at garage sales. Just use your imagination and you can come up with some really nice ideas of your own. If you have any questions or would like to offer any craft ideas to share please contact me.